Home NEWS The University Organizes the First Counselling Conference Entitled "Psychological Counselling in Palestinian Universities: Reality and Aspirations"
The University Organizes the First Counselling Conference Entitled "Psychological Counselling in Palestinian Universities: Reality and Aspirations"
The Deanships of Scientific Research and Student Affairs organized at Arab American University, sponsored by the President of the University, Professor Ali Zidan Abu Zuhri, the first counselling conference entitled "Psychological Counseling in Palestinian Universities: Reality and Aspirations". 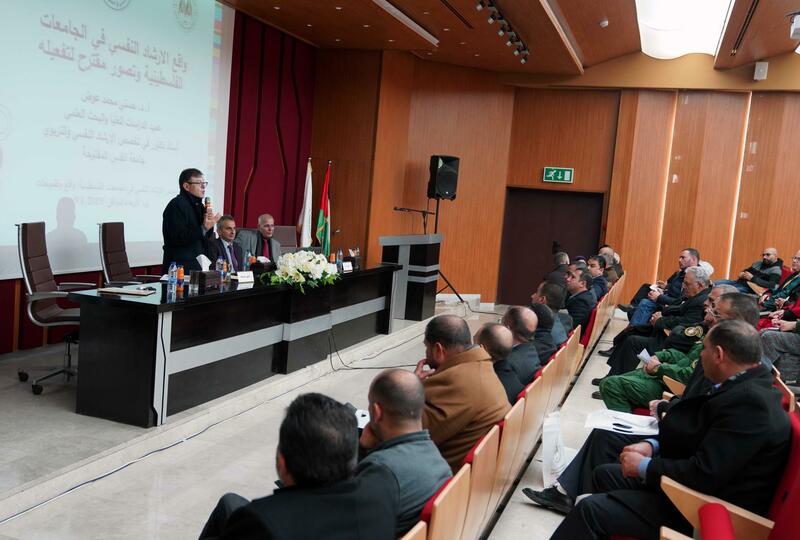 The conference aims to raise awareness of the importance of psychological counselling in Palestinian universities and to develop and enhance the relationships between psychological counseling at the university and both at home and school since its considered as an educational institution before university education. The conference was attended by the Dean of Student Affairs Dr. Bashar Daraghmeh, on behalf of the President of the University, General Director of Counselling and Special Education in the Ministry of Education and Higher Education Mr. Mohammad Hawash, the representative of Ministry of Health Dr. Wissam Subaihat, the representatives of the directorates of education, health and medical centers, representatives of the security services, a members from the academic and administrative staff at the university, and students. 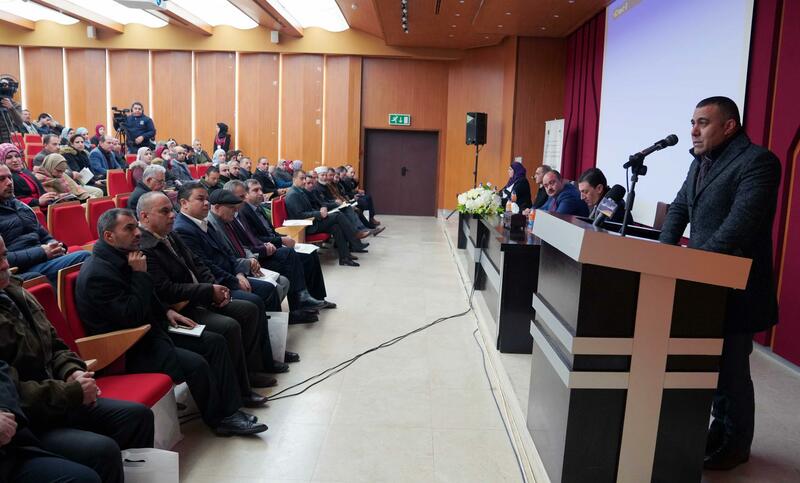 After the national anthem and reciting some verses of the Holy Koran then reading Al-Fateha on the memory of the souls of the martyrs , The conference was opened by the Dean of Students' Affairs Dr. Bashar Daraghmeh, in a speech welcoming the attendees and conveying the greetings of the President of the University, Professor Ali Zidan Abu Zuhri, assuring that the university is to be known as a shed light that focuses on improving education and innovation, as its proud to support its students in investing in their knowledge and skills that enables them to start their career journey and become contributors in building the society and development. He pointed out that university atmosphere is one of the most important stages in the life of students, where he can build his personality, he will be exposed to many situations and problems that will affect him directly, so he will need the counselling and guidance by specialists, educational and psychological guidance plays a big role in the life of the student, assuring that counselling is an indispensable process in university life and is one of the basic pillars on which the educational process is based on. The General Director of Counselling and Special Education in the Ministry of Education and Higher Education Mr. Mohammad Hawash said that the topics that will be presented in the conference will touch the objectives of the ministry, explaining that the educational counselling is one of the most important axes of development, noting that the ministry has more than 1500 educational counsel in our national Schools, in addition to the presence of specialists in special needs issues. He expressed his pride for the cooperation between the Ministry and Arab American University, where they recently announced the new singed agreement between the two parties, that focuses on training students in the resource, physiotherapy and functional rooms. The representative of the Ministry of Health Dr. Wissam Subeihat praised the role of Arab American University in supporting the health system in the Jenin governorate in particular and in the governorates of the country in general, pointing out that the young generation is living factors affecting their psychological condition under the division, occupation and the poor economic situation. He added that the Ministry of Health has a specialized center for health and counselling. 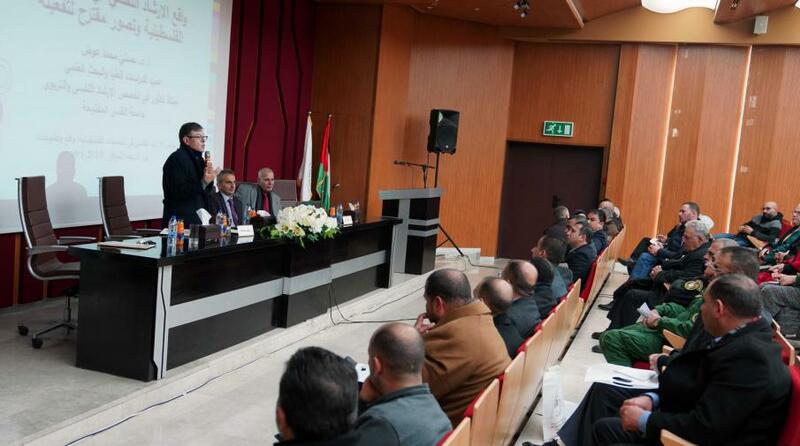 He stressed the importance of providing psychological and counselling support to young generation, that represents a large percentage of the Palestinian society. The head of the conference preparation committee Mrs. Laila Haraz Allah, said: "The philosophy of educational and psychological counselling at the university depends on certain facts, which are represented in many phases, most notably that the university student is able to understand and rely on himself, and can take responsibility and participate in decisions that determine his future, Therefore, the provision of counselling programs for students in the university is an urgent need that helps them to discover their abilities and talents and guide them to disciplines and professions that are consistent with their tendencies and abilities and help them to acquire Decision-making skills and concord with the university environment in order to achieve mental health. The opening session was followed by an Expert session moderated by the Dean of the Faculty of Arts at Arab American University Dr. Marwan Abu Al-Rub, many work papers were presented several papers entitled "Emotional independence according to the university students experience by Dr. Shafiq Musalha, and "The reality of psychological counselling in Palestinian universities" by Dr. Husni Awwad And “the level of unemployment concern among university students in Ramallah and Al-Bireh Governorate” by Dr. Laila Ghannam an assistant professor in psychological and educational counselling. the first session was moderated by Dr. Eyad Othman, where Dr. Ahmed Hanani from Modern University College presented a paper entitled "The Behavior of Bullying among University Students in Palestine" and Dr. Rabie Atair from Educational counselling Dept in the Directorate of Education in Tulkarem presented his paper entitled “the Degree of students need for psychological counseling technology in Khadouri University”. “The role of the psychologist from the point of view of the Palestinian university students regarding scientific perception" was the title of Dr. Mohammed Abu Zeid's paper from the Department of Counseling and Special Education in the Ministry of Education and Higher Education, while Dr. Abdulla Abdel Al Hadi from Al-Aqsa University presented his paper entitled " The Psychological and counselling needs and its relation in activating the academic self among female students of faculties of education in Palestinian universities", the paper presented by Dr. Nefouth Abu Saed from the Ministry of Education and Higher Education in Gaza was entitled "positive thinking and its relationship with the psychological compatibility of students of Palestinian universities in Gaza." The Second session was moderated by Dr. Majdi Zamel, which held scientific papers by Dr. Mohammad Abu Albih from Al Quds open Univeristy – Qalqiliya, entitled "Strategies for Educational counselling in increasing the compatibility and adaptation of students in the university environment ", Mr. Musa Odeh from Arab American University presented a paper entitled "The Impact of Family Security on Academic Achievement among University Students”. Dr. Idris Jaradat's paper was Participation of Students with Disabilities in University Activities and Events Case Study ", while Dr. Mahmoud Al-Barghiti and Dr. Nayed Al-Abadala both from Al-Aqsa University in Gaza presented a working paper entitled" Identity crisis and its relations in future concerns, motives and achievement by a sample University students”, while Mrs. Tahani Abulaileh from UNRWA presented a paper entitled" Future Career Concerns and its relationship to ambition and motivation for achievement among students of psychological counseling at the Faculty of Education, Al-Aqsa University in Gaza. " In the third session moderated by Nahida Al-Arjah, Both Dr. Mazen Al-Sheikh from Al-Aqsa University and Ismail Al-Sheikh from the Ministry of Education and Higher Education presented a paper entitled "Psychological Characteristics in the Light of Positive Perceptions of a Sample of University Students with Disabilities" and "Stigma in Light of Academic Achievement and the concern of the future career for students with disabilities in Palestinian universities" was the title of the paper of Dr. Ashraf al-Jabali and his colleagues from the Islamic University of Gaza, and Mr. Mohammed Shbeir and Mohammed al-Zatma from the Ministry of Education and Higher Education, A paper entitled "A Proposal for the Development of Psychological Counseling Services Offered to Students in Palestinian Universities in the Light of Recent Trends of Students Care in Universities"
Dr. Amjad Gumah from Al Quds Open University Rafah Branch, presented a paper entitled "the Motivates of using social networks by Palestinian students in Gaza governorates" and Mr. Reham Al-Kilani from the World Vision Foundation presented a paper entitled "Dependability and its relation to personal and social harmony by a Student sample from University of Gaza ", while Dr. Aba Abdul Haq of Al Quds Open University presented a paper entitled" The Role of the Palestinian Photo according to the Stanford Pinnacle Scale-Fifth Edition in Diagnosis and Counseling. "